I don’t often buy red meat, but when I do I like to make sure we eat it in small amounts. Adding lentils and extra vegetables is a great way to bulk out a meal and give it added nutrients. It also makes the meal go a lot further and saves you money too. 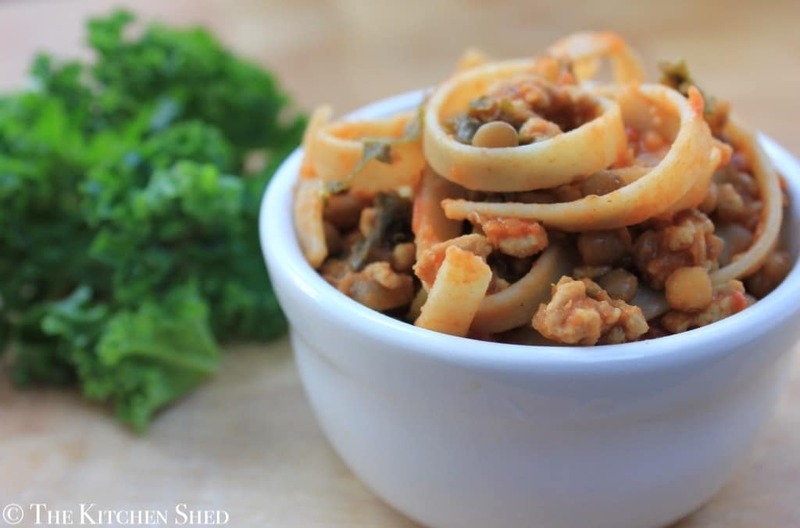 This Clean Eating Kale, Lentil and Pork Ragu is one of my favourite recipes and it’s all thanks to the lentils. I love lentils and these tiny protein packed brown lentils are the best. They are Cooks and Co and I get them in a tin, ready to eat from Ocado. They are packed in water with no added salt or sugar and cost around 69p – bargain! 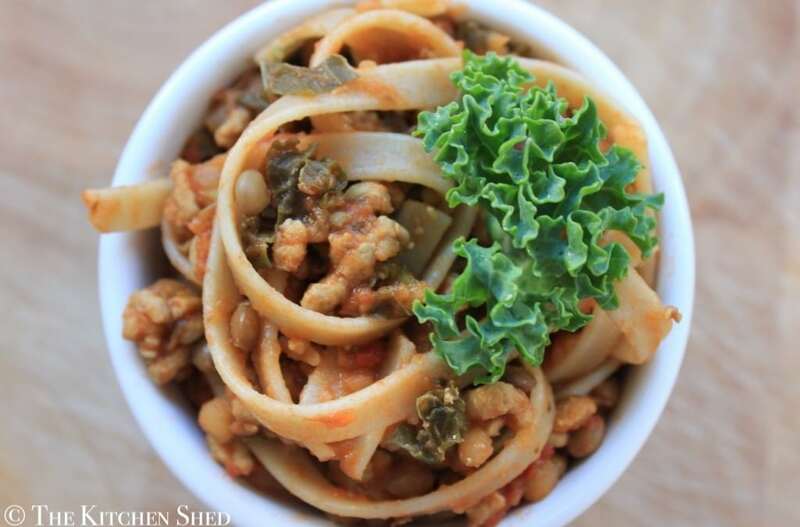 This Clean Eating Kale, Lentil and Pork Ragu is one of my favourite recipes and it's all thanks to the lentils. I love lentils and these tiny protein packed brown lentils are the best. Put the oil into a saucepan and add the diced onion and kale and cook on a low heat for 2-3 minutes until softened a little. Add the pork mince and stir to prevent it sticking. Once the pork is cooked through (all white, no pink) mince in 2 cloves of garlic and add the basil, oregano, garlic powder, onion granules and sea salt. Once bubbling, turn the heat down a little and let it bubble away for 20 minutes, stirring occasionally. After 20 minutes, turn the heat down to low and add the drained, rinsed tin of lentils. Stir and cover for 5 minutes until the lentils have heated through. (Stir occasionally to ensure the lentils don't stick to the bottom of the pan). Serve with wholegrain pasta of choice (I used wholewheat tagliatelle) or serve on top of a baked sweet potato with a large side salad. This is so tasty, however do you add any corn starch to help thicken the sauce? My sauce seems really watery, it could be due to not using the chopped tomatoes from a carton as they only seem to sell chopped tomatoes in tins. Hmmm… I haven’t ever needed to use corn starch to thicken it. I guess the tomatoes could have made a diffenece, but probably not likely. Was it a 400g tin? The only thing I can suggest is to simmer it for longer, or over a higher heat, but I will redo the recipe to double check the measurements are correct. I’m glad it tasted good though! Knocked up a batch of this the other night. Very tasty and filling. 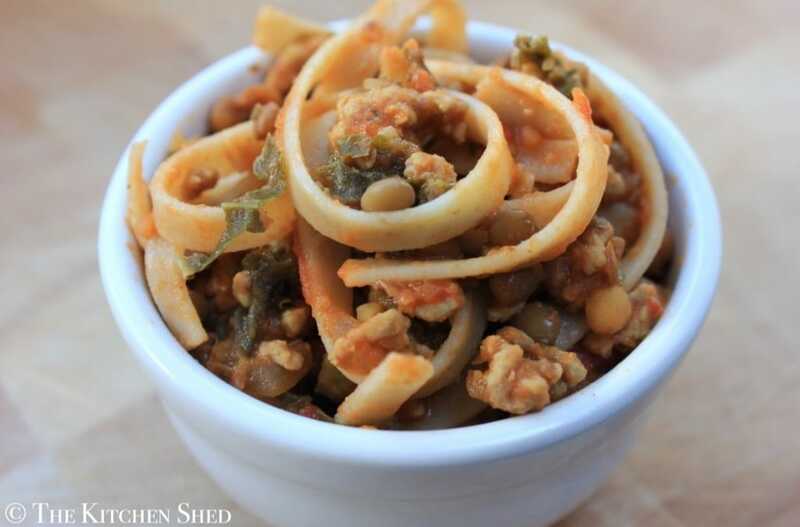 Another great healthy recipe from the Kitchen Shed! That looks amazing we intend to get one of those peelers very soon is it just courgette or do u mix it in with noodles or pasta?? wow cool nope i think we will try it out on our low carb day 🙂 looks like some very colourful food experiments comiing up cant wait! have you seen it anywhere other than lakeland?? We had chicken (leftover from the roast) rocket and pesto quinoa salad. Best bit was this morning my 4 yr old threw a tantrum about not liking quinoa, this evening she asked for seconds. I did have to tell her the rocket was spinach though. Omg, just realised she’s actually 5, they must stop this growing malarkey! Mmmm! One of my favourite things to eat! That does sound good! Tinned tomatoes can be clean! Left over pulled pork & spinach in a wrap… Just what I needed after boot camp! We had chilli- would have had it with courgette spaghetti but forgot to buy them this week so I had sainsburys wholewheat spelt spaghetti instead. And the recipes keep rolling in…Emma Lyons…..
Wholewheat penne with turkey mince and lentil bolognese. Made a batch yesterday and it was perfect after rushing about this evening after work. Very homey! Wow!! Love this. I know that this is going to become a regular meal in our household.